True to his Modus Operandi, Isildur1’s return to the high stakes tables on Full Tilt Poker have seen two huge wins followed by an even bigger loss. After lighting up a who’s who list of online poker including Justin Bonomo, Ilari “Ziigmund” Sahamies, Tom “durrrr” Dwan, and Brian Hastings in his first two days back at the nosebleed tables the mysterious online poker player from Sweden’s bankroll took a massive hit. According to Highstakesdb.com, the day started with a short session with Tom Dwan that resulted in a $33,000 loss. Isildur1 followed this up with a rematch against Justin Bonomo, whom he relieved of some $550k a few days ago, but this time it was Bonomo getting the best of it and ending the battle up $233k. However, the real excitement came against Brian Townsend. Proving he’ll play anyone, Isildur1 took on the man who admitted to data-mining the Swedish player, which led to multi-million dollar losses for Isildur1. Townsend was able to take a further $650k from isildur1. In all, Isildur1 lost over $900k for the day, wiping out more than half of his winnings since his return to the virtual felt. 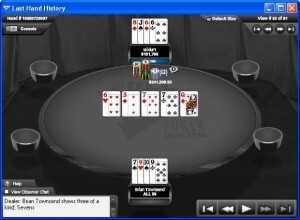 This entry was posted on Saturday, February 20th, 2010 at 10:05 am and is filed under Poker News. You can follow any responses to this entry through the RSS 2.0 feed. You can leave a response, or trackback from your own site.